Ružica Mučić is the elder sister of the seer Marija, who for years, on the 25th of each month, sends us a message from the Madonna. 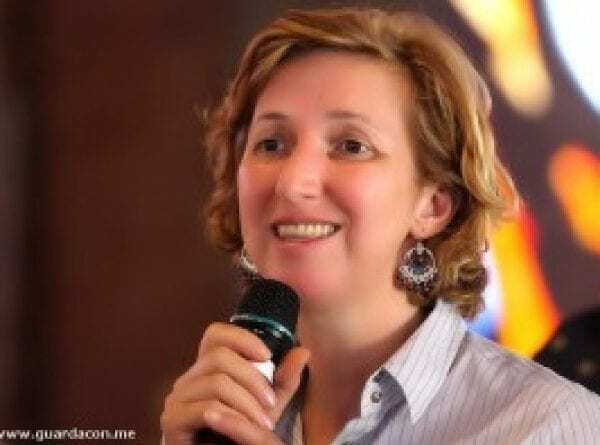 We met her at her home in Medjugorje and she gladly gave us an interview. With personal and moving words, she told us about the events of the first days of the apparitions. Ruźica, you are Marija’s sister. From the first days to today – I remember when we came here in 1983 – you’ve always been in a good mood with a smile on your face – what are your memories of those early days? Those were unforgettable days. Days full of prayer, joy, happiness. We could not describe how beautiful it was that we were experiencing. How did you hear about the apparitions the first time? Considering that neither my mother nor my sisters had phoned me, I thought they too knew nothing. Marija and Milka lived at home with my parents in Medjugorje. My three brothers were in Germany. I thought that my parents had gone to the center of Medjugorje; in fact our house was in the village of Bijakovici. The next day, when I got to work, a colleague asked me: “Ruska, have you been to Medjugorie? I said, “no, why ?. Shee told me: “But how do you not know that your sister appeared to Our Lady? “. I replied: “but you do not even know my sister”. There were Muslims, Orthodox, Communists, Catholics, we all worked together. 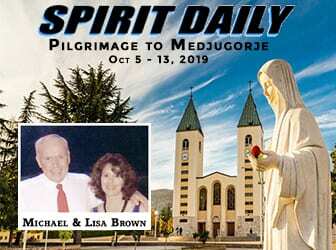 All spoke of apparitions in Medjugorje. I did not know anything about what had happened. When I look back today, I wonder why I did not ask anyone about those apparitions, nor who the children were; I simply listened to what others told, from one group to another. At about 13.30 came a woman in the locker room who knew my family, while I washed my hands. 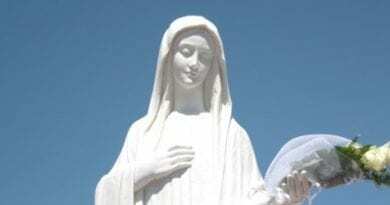 She told me: “Have you already been to Medjugorje? No, I answered. But do not you know? she told me. I replied. What should I know? The Madonna appeared to your sister Marija. At her words, I felt as though struck by lightning. I began to cry and all the words I had heard until then passed through my mind. Some said that it was telepathy, others talked about drugs, others said that these children were not normal: I was totally confused. I got ready quickly and went home. There my mother-in-law saw me in tears and asked me what had happened. 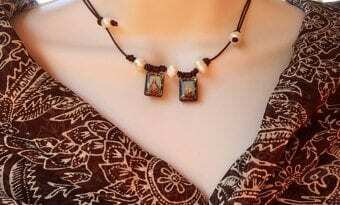 I replied: “Mother, mother, in the factory they told me that Our Lady appeared in Marija”. Do not cry – she told me – now Carlo arrives. I did not think he would be back from the factory first. He also said: do not cry. If it’s about Our Lady, then thank God, if it’s something else then we’ll help you. At eight o’clock we went with our little car, a fiat, to Medjugorje. Everyone wanted to come with us. When we arrived there were many people and we could only continue slowly. It was the feast of St. Peter and Paul, on 29 June. When I left home, I saw that there were many people. After listening to what people were saying, I thought I wanted to meet my sister Marija to see if it was normal. My mother was at the door of the house and told me: “where have you been? The whole world is here and you were not there. ” I saw that Mom was happy and I felt calmer. At home Marija made coffee, Milka made cups, there was no place to sit in the house, she was full of people. When my father said, “Ruska has arrived” Marija turned; in one hand she had the Crucifix, in the other the coffee. She saw that I was crying. She said: do not cry, I’ll explain everything to you. She left what she was holding and hugged me. I said, “You do not have to explain anything to me. I believe you. You’re normal, as always. When I saw that her face was normal as always, I believed her. It was my first meeting with her, after hearing about Our Lady. Where did the apparitions occur then? There were many people? Then the apparitions took place in Podbordo. There were many people, from church to podbordo there were many people, there was such a swarm of people as in a beehive. At the beginning were there also signs? What memories do you have? I have not seen many signs. I saw the cross turning and disappearing, I saw the signs in the sun. Once I had the chance to touch the Madonna. How was it? What did you try? We passed in front of the police station, it was August 2nd, the feast of Mary of the Angels. Police had already begun to impose traffic bans and it was not possible to go to church and Podbrdo; Even the gatherings of people were not allowed. Where large groups of people were created, the police immediately disperse them. We went to the shrubbery behind Marija’s (current) house and hid there. The visionaries were standing during the apparition and when the Madonna came they all knelt at the same time and began to pray. I was there with another girl; Mirijana turned to me and said: “Ruska, Our Lady asks if you want to touch her” I was shocked and said: “Madonna, I would like to touch you but my hands are too dirty. I am not worthy to touch you, but I would like to do it with my heart “. Mirijana stood up, took my hands and said: “this is the head, these are the hair, this is the neck, here the shoulders” holding my hands. I did not hear anything in my hands but a great light penetrated me. I did not know if I saw the light with the eyes or the soul. I opened my eyes and the light was in me. It was as if he had caressed, cleaned, washed; the light was so strong, I can not describe it with words. How do you see your sister? How much has changed? As for the apparitions, our life has totally changed. The visionaries have become adults and have everyone in the family. Life goes on and nothing is more like a time. But when we begin to pray before the apparition, then everything is as it was before, like 37 years ago. 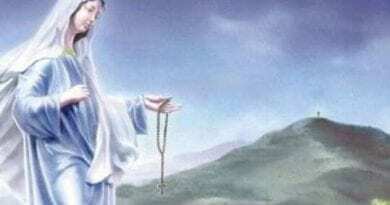 We all recite the rosary with the heart. Regarding the apparitions to marija, if the apparition happens at 17.40, the rosary begins at 17. We pray the joyful and painful mysteries, then recite seven our father. She does not know exactly when Our Lady will appear, sometimes she recites an Our Father, sometimes two or more and then the Madonna arrives. When Marija stops praying aloud, we understand that the Madonna is there with her. What I find interesting and amazes me is how the visionaries manage to manage this situation, with daily appearances lasting for many years. The pressure has lasted for years: what has not been said, what we have not heard. The visionaries have been cursed together with their families. Without God’s grace it would have been impossible to bear all this. You do not think if you want to continue or not, but on the contrary, you feel in the soul that you have to move forward. Every day lies the strength to move forward. An inner joy is felt. When you hear negative comments, when you read negative words about the visionaries, for example about my sister, it really hurts, but I think: the work of God can not be destroyed, it remains forever. We must not get angry but be embraced by joy and then we no longer think of the negative things read or heard. How did your children and grandchildren welcome you when they were little? Did they profess the Catholic faith? 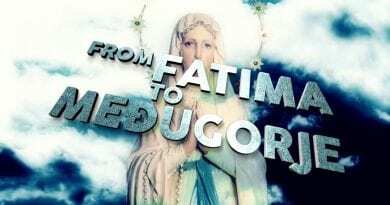 Many young people in fact take different paths … .. Medjugorje remained in their hearts? Yes, thank God! Technology has taken giant steps so much that we, older people, can not keep up. Nevertheless young people pray, go to church, confess, etc. My daughter has three children and there is not a Sunday when she and her husband did not go to church and we did not take the children with them. They always went to church even when the children were very young. Even with my children it’s the same thing and not just in our family. In general here we go to mass, we confess and we are close to the sacraments. Young people too. Here in Medjugorje there are many young people in the choir, in church, especially on Sundays. But not only in Medjugorje, even in neighboring parishes. Everywhere young people are very active. The Franciscans certainly give their contribution. They have not changed either. They are open to young people, this is the most important thing. When my son was young, he went to Mass every morning. This was noted by a priest who had come to the parish of Humac and asked if he would like to attend a seminar in Mostar and if he wanted to go with him to Krizevac or Podbrdo. The visionaries asked the madonna at the beginning what they wanted? The visionaries asked the madonna questions and she answered. Do you still remember a few questions? I never told my sister Marija to ask Our Lady questions. The joy of having Our Lady among us, who appeared to my sister and who had come to visit with our family, all this was so great that I could only cry and thank: “Our Lady thank you for coming to our family and to have appeared to my sister. Also today I always say: “I thank you for your continuous appearances to Marija, I thank you, O Mary, for being among us”. And I will continue to do it because it’s something extraordinary for me. It is a great grace but also a great responsibility. We are accountable before God and we will have to give it to him when we are in his presence. The interview was conducted by dr. Maximilian Domej on April 8, 2017. ← Michael Goodwin: Kavanaugh chaos- crazy — What country are we in? What country are we becoming?